The most widely produced wheeled armored vehicle in service in the West is the Light Armored Vehicle (LAV) and Piranha. With more than 9300 vehicles produced to date, and with deliveries to 21 countries, this family of vehicles has proved hugely successful. Unfortunately, due to sales rights restrictions, we cannot offer 7521: Lav And Piranha - The Extended Family for sale in your country. The most widely produced wheeled armored vehicle in service in the West is the Light Armored Vehicle (LAV) and Piranha. With more than 9300 vehicles produced to date, and with deliveries to 21 countries, this family of vehicles has proved hugely successful. The family was originally designed by the Swiss company MOWAG, which is now part of the General Dynamics Land Systems stable. Concord Publications' latest title in its Armor at War Mini Series covers this popular armored vehicle, which first appeared in prototype form in 1972. The book is divided into sections covering various countries and geographic regions where the LAV/Piranha is found. It opens with Canada and includes the 6x6 AVGP before moving on to the 8x8 Bison, Coyote and LAV III. 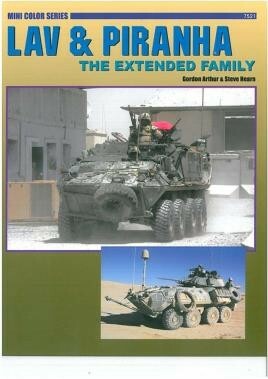 The next chapter covers the LAV in USMC service. The chapter on Australasia features the ASLAV and newer NZLAV, while Europe's Piranhas receive a chapter all to themselves. The final section covers miscellaneous countries such as Nigeria and Saudi Arabia. This book is crammed full of background information on the LAV/Piranha, and records its history and development. Details of variants, deployment and organization (plus combat/operational use where relevant) is given for each country using the vehicle. The book features more than 160 photos showing external and internal views of these vehicles, including the latest combat deployments in Iraq and Afghanistan. Detailed captions provide pertinent details in this book that offers a unique photographic record of an attractive and versatile vehicle found the world over.